If it is possible to make a worldly diagnosis, one would say that the end of the future is near and something like an impasse in time can be sensed in both the art world and on a global political scale. The contestation of history means that there is no longer any certainty in the past; the future is unforeseeable, marked by the anticipation of impending ecological catastrophe, and the present seems to lack any of the imaginative political momentum required for change. Endless crises, deeply enmeshed and producing one another, have stretched on for decades. The iron grip of neoliberalism and accompanying economic inequality shows no sign of abating. Global capital continues to widen its reach into all corners of the planet in search of profit, heedless of the destruction it wreaks on the way. Territorial disputes and ongoing conflicts such as those in Syria, Yemen and Palestine are no closer to resolution. Humanitarian catastrophe and the mass displacement of people have become hallmarks of the last decade, compounded by an increasing number of climate refugees. Despite over forty years of warning, vulnerable coastal areas such as Bangladesh are slowly being submerged in water, foreboding an increasingly uninhabitable future. Disillusionment with political elites and governmental structures is as ubiquitous as the threat of terrorism. What all of these crises have in common is a sense that resolution or even progressive change is beyond reach; the present has come to a halt, and the possibility of a future is increasingly unthinkable. If the future begins by making an image, contemporary art and visual culture may be crucial for the theorisation of futurity, with their ability to open up fictional worlds for our reflective engagement. At the forefront of this enquiry is Cairo’s contemporary art scene. Over the last year ‘time’ and ‘futurity’ marked themselves as central motifs in two of the biggest events that took place in the city. The exhibition at Manial Palace entitled ‘Nothing Vanishes, Everything Transformed’, organised by Art D’Égypt,  featured over twenty-eight Egyptian artists and contrasted their contemporary art works against the backdrop of some of Cairo’s most important cultural heritage sites. Meanwhile the concurrent ‘Something Else: Off Biennale’ hosted by Darb 1718, which included fifty-three local and international art practitioners, addressed the theme of ‘What if it did not happen?’,  inviting artists to pose alternative futures to altered pasts. These events that took place across the Egyptian capital brought together three contemporary works that it is not only fruitful to consider in the context of future making, but which also expand our arsenal of methodologies for thinking about futurity. While each work has a different temporal dimension, together they present an argument for art’s capacity to transgress linear chronology. By engaging simultaneously with multiple registers of time, and collapsing the supposedly distinct categories of past–present–future, art allows us to escape the confines of a preordained trajectory. In this way, the works activate a space in-between, one that is not rooted in a time or place and can bypass dominant ideologies, for the making of unconstrained and more imaginative futures. There is no better place than Cairo to ruminate on and unpick the notion of time. It is a city where the old and the new, the past and the future are constantly interweaving, and where markers of time are as subtle as the white dust and black soot marbling the trees along the Nile. The streets are scored by a marshalling of colonial architecture whispering of violent histories not long past; desert compounds live out the dystopian futures of Ahmed Towfiq, and round-the-clock repair work testifies to the lifespan of everyday objects. On my way from downtown to Manial Palace on Rhoda island, the sun still early in the sky and the dawn orchestra only a gentle hum, I witnessed repair in constant action against the effects of time. Street cleaners swept the roads of yesterday’s debris as parked up motor vehicles underwent refurbishment – all things being returned to a previous and familiar condition. Scaled up, outdated authoritarian regimes are maintained through political agendas that prioritise stability over transformation, and UN climate change agreements amount to little more than a band-aid on a bullet wound. The thought stung a little, and the citrus tang in the air began to fade as morning drifted through. I was left with the feeling that our current impasse is the result of a system that opts for sealing over the cracks rather than radical change – a system of regressive repair. And, if that is the case, I wondered what alternative function repair could play in more transformative future making. My walk to the exhibition could not have served as a better preamble for the works I was about to see. I was moved from my relaxed musings into a full on confrontation with the myriad connotations of repair, so excellently explored in Yasmine El-Meleegy’s Rites of Passage. 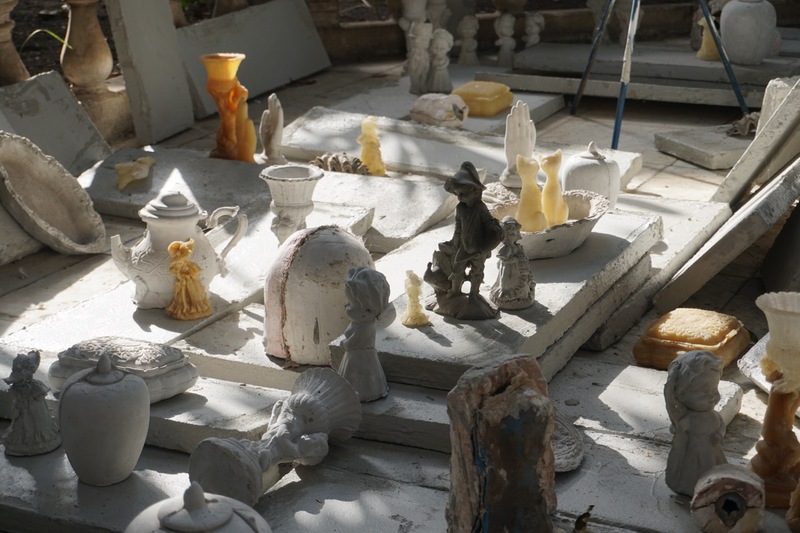 Spilling out across the exhibition space, Rites of Passage was a collection of wax, porcelain and cement castings of ageing household trinkets. Cartoon figurines, cats, pots, couches, and dolls hands; each intimately scaled object a product of a rescue mission to remake or repair the artist’s deteriorating personal relics. 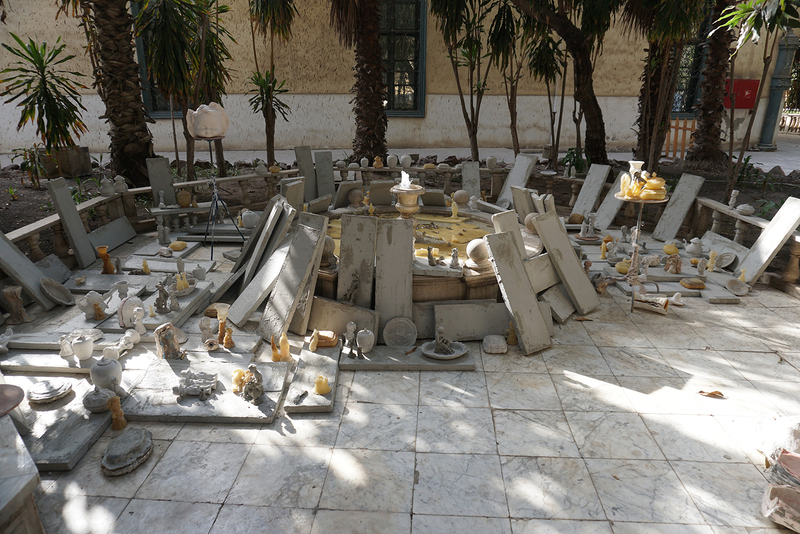 The archival assemblage was disorderedly centred around a water fountain, and it is at this point that the work departs from a commentary on a decaying world where things are falling apart. Instead, this unexpected central point – so often associated with cleansing and rebirth – presents a second more positive perspective and hints at a world in a constant process of fixing and renovation. Despite or perhaps in conjunction with the overwhelming presence of nostalgia, we are thus reminded that repair is not a return and the work cautioned us against yearning for the past. Repair becomes relevant to future making at the juncture at which the perspective shifts from ‘preventing decay’ to ‘renovation'. By nature of being an act that restores something to an improved condition, repair is about making something anew – objects, futures, or otherwise. So long as we think of repair as positive and creative, it has the potential to be a transformative process that carries things into a different time and place in a renewed form. Rather than attempting to remake the world from scratch – which can be an inherently destructive impulse – repair, if done effectively, could allow us to work carefully with the current state of things and still radically transform them into the future. Rites of Passage takes the transformative potential of repair further by establishing it as a performative act and a starting point from which we might recognise and discharge our moral responsibilities in the world. The work in this way demonstrates the ideas of ‘New Materialists’ such as Jane Bennett,  articulating how human and non-human entities are embedded in a chain of mutual entanglement. New Materialism is a way of thinking that recognises the interdependency of the world of people and things, and disrupts the idea of human-centered action in the world. This shapes our responsibility to a planet in the midst of a growing ecological crisis, and also recognises the effect that both humans and non-humans can have on social and political change, situating ‘things’ as active components in the ongoing project of future building. This means, since we are all together in this enmeshment, we bear certain ethical responsibilities toward a world of other actors. Rites of Passage uses repair to pilot these ideas into the realm of action. The sprawling mess of miniatures signals a two-way relationship: not only human attachment to objects, but also the affective capacity of objects. Compelled to attend to the objects, El-Meleegy’s dedication and extensive repair work makes evident their ability to attract, influence and act upon the world and upon us. At the same time, in nursing the memorabilia back to health, repair becomes synonymous with care. The act of repair thus reconnects us with the world and nurtures a form of attachment that is necessary to sustain it. In this way, repair not only helps us attune ourselves to a complex and entangled world, but it offers a blueprint for nurturing our responsibility to things around us, making anew a future almost forgotten by inserting care into our relationship with the world of things. Deep in contemplation, by the time I stepped back outside the sudden changes caught me off guard. My memory jumps – the evening arrives at an accelerated pace. The day’s events have been scrambled, but in any case, the lineal disruption seems appropriate and we will return to Manial Palace in a little while. The sun had begun to melt towards the ground, and with this relief the air was cooling and brows were drying. Leaving thoughts of Manial Palace to ferment in my head, I made my way to the metro station. The city was in a state of transit; daytime life was closing down and the sounds, smells and sights were dressing up for the night. A symphony of car horns and animated voices reverberated, but just as the energy of this transition began to swell it was abruptly silenced as I ducked into the station. I exited the other end at Mar Girgis, the evening not too far away now. The place was glowing; the low yellowing sun reflected off the bleached stone and wreathed the neighbourhood in a white gold halo, denoting some kind of (rather fitting) religiosity. Contained within the walls of this Roman fortress are centuries of history and reminders of eras past. Churches, synagogues and museums root in the ground histories unforgettable, and carry into the present stories of Byzantine rule, of occupation, and the arrival of Christianity into Africa. Yet this historic area of Cairo refuses to be locked into the past. Happening only a short walk away and confrontationally out of place, the ‘Something Else: Off Biennale’ was in full swing. The neighbourhood had made a clear impression on participating artist Sherif El-Azma. Echoing the lingering presence of history, his latest work Offering confronts the impact of the past on our visions of the future. Showcasing artefacts from a dystopian near future, imitation display cases hold plastic libation tables that resemble 3D architectural plans. 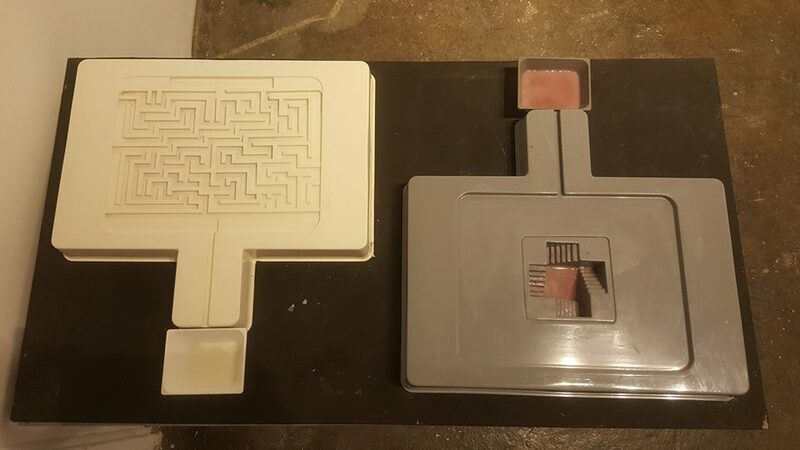 Similar in appearance to their counterparts from the Greco-Roman period and Ancient Egypt, the hollowed out sections in these rectangular blocks include a maze, a staircase to the underworld and multiple compartments for consumable offerings. 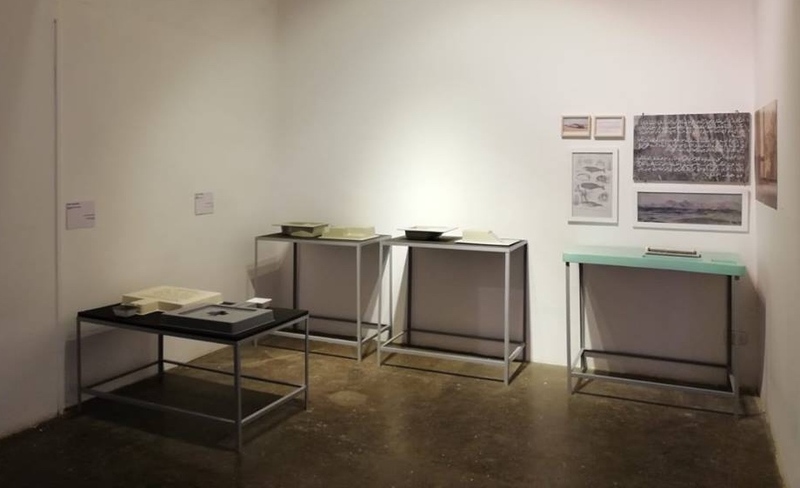 Their referents are not only ancient, however, and their plastic composition and dimensions draw us from our archaeological interpretations into modernity; the objects simultaneously inhabit the twenty-first century, the size and weight of each table being based on the standard issue canteen trays for all prisons in North America. Yet despite this functional ambiguity, there is a slight commonality between these two seemingly unrelated historical points of reference. The dimensions of both the libation table and the prison tray conform to the dimensions of the average man in their respective epochs; they are designed to accommodate the human body, and are in this way ergonomic. These objects are unable to belong fully to either the past or the present, however, and the uncanny fusion of the two periods achieves something further, suggesting the tables to be the product of another time and place, and a civilisation yet to arise. This tenuous unification of ancient and recent history through the ancestry of ergonomics acknowledges that our understanding of history is often equally tenuous; a heavily curated progression of events. ‘History’ is not simply the recording of facts and happenings, but a process of selection and exclusion that is intended to give the appearance of continuity and which lends itself to deterministic thinking. The idea that there is an inevitable pattern to history leads us to make assumptions about the future and instantly limits our imaginative capacity. Embodying this limited thinking, El-Azma’s libation trays are artefacts from a future already written; the repetition and fusion of old forms ultimately signify a failure of the future to transpire into a world radically different from the one in which we currently live. Such a reliance on the past in our imagining of the future not only tends to obfuscate and obstruct our vision forwards, but can lead us to relinquish our autonomy to shape the future. This reminds me of Walter Benjamin’s ‘theses on the philosophy of history’,  in which he uses Paul Klee’s ‘angelus novus’ to give form to his critique of historical progress. Casting the figure in the painting as the angel of history, Benjamin imagines him fixedly facing the past as the unfolding events of history pile wreckage at his feet. The angel cannot look away, as the storm from Eden blows him inexorably into a future to which his back is turned. What strikes me about Benjamin’s narration of the image is the suggestion that our preoccupation with history keeps our gaze averted from the possibilities of the future. This neglect is tantamount to a relinquishing of our responsibility for making futures. While representing the trap of historicism (and even historical materialism), I would say that, in a departure from Benjamin’s thinking, Offering also carries a sense of futurity that has disappeared from twenty-first century life. Intentionally embodying what Mark Fisher calls 'hauntology', the ‘archaeological’ objects are saturated with the sense of dead futures. The anachronism in the work is used to illustrate both our disappearing hopes, and the temptation to revive our anticipations of the future by returning to the past. El-Azma sees himself as an archaeologist of the future, but what he excavates is a world obsessed with the past to the detriment of its future. In order to escape our entrapment in dead or stale visions of what is to come, we need to lay the past to rest and disentangle ourselves from its persuasive power. The atmosphere turned a deep navy blue. By the time I resurfaced, the sticky evening sky had gone hunting for the realest of fireflies. Mostly fazed out by anthropogenic light, only the brightest of stars were visible in its web. My mind filled with thoughts about reconfiguring our relationship with history and of the world’s worldlings. It’s strange to think that the events we allow to affect our futures are only a millisecond of the earth and her starry companions’ life spans. The celestial sphere seems out of time with our own earthly conceptions. Forever fascinated by the universe, the cosmos is littered with time travellers adrift between the stars and galaxies, attempting to know the secrets of the past and future. But to time-travel successfully you must know the coordinates, the exact time and place of where you want to be. The dizzying celestial sphere. The earth rotates westward on its axis and rewinds its orbit around the sun. The sun is slipping off the highest point in the sky, and I’m back in the grounds of Manial Palace. Plum tomatoes, blushing pomegranates and fleshy aubergines colour the sidewalk, and the noontide streets salivate over greasy smells of sweet onion. Day-life undulates around the city. I had spent the last several hours inside wandering around the exhibition ‘Nothing Vanishes, Everything Transformed’. A shattering of colour flooded one of the rooms, coaxing me in. Encircled by a trellis of stained glass windows, Sounds of the Seven Tears radiated in the centre. Sounds of the Seven Tears is the latest instalment of Shady El-Noshokaty’s multi-episodic research-based art project entitled Colony. The entry point for the project, which began in 2013, was a discolouration of the skin on the artist’s hand, diagnosed as a ‘colony’. Continuing to unearth the term for each ensuing instalment, it has been used to refer to skin cells, communities of rats and larger colonial projects. Using ‘colony’ as a common thread for a manifold of different subjects to connect, the project unpacks ideas of spatial and territorial organisation for the purpose of imaginative world-making. In the latest episode, the spatial-geographic focus takes on an additional time-based dimension. Merging science fiction and quantum physics, the work teleports us to the fundamentals of creation and indicates towards the possibility of infinite futures. The work could be called science fiction, not only because it combines the disciplines of science and maths with alchemy, myth and magic, but because it is also a vision of possible worldly human transformation. Bonded glass hexagons tessellate across the room, and resting upon this benzene-ring plinth is an abandoned future laboratory. 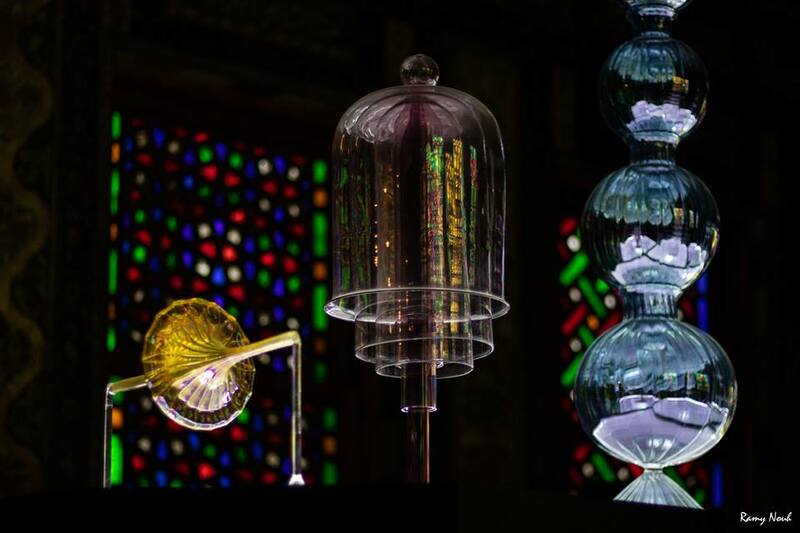 The polychromatic arrangement of mutated glass structures – of rats, test tubes, surgical needles and alchemy equipment – is a hypothetical fusion of seven elements with seven wonders of the universe. 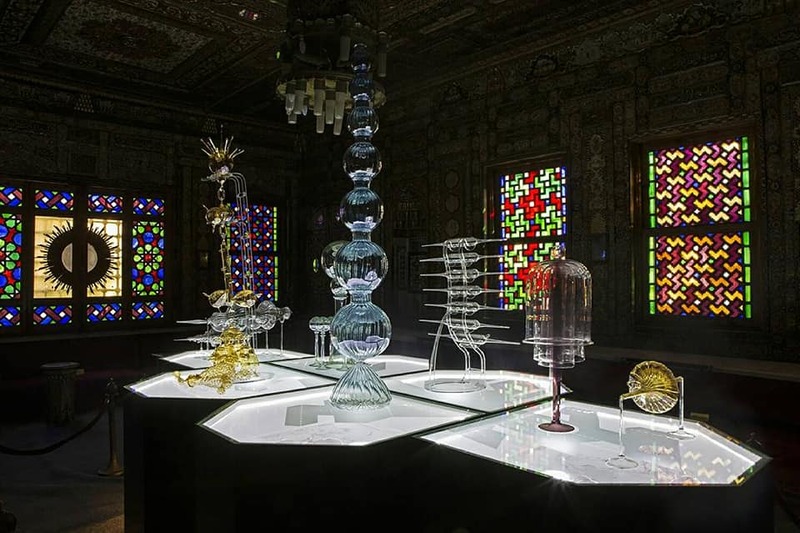 Each glass structure is a particular arrangement of variables: a unique composition of one of the seven planets; seven colours of the rainbow; seven seas; seven chakras; seven days; seven musical tones; and seven stages of thought. This particularly fragile science experiment suggests that worldly creation is a coincidental arrangement of certain variables, and that there are various other possible arrangements. Out of these variables alone, forty-nine different arrangements can be formed, whilst further unions between these new arrangements produce endless possibilities. Each glass ensemble works in unison with the others, and it is the inability to distinguish between one worldly arrangement and another that indicates that each of these seven-variable arrangements are happening simultaneously. The idea of an infinite number of possible futures or trajectories for world making goes back to the laws of quantum physics – that is, the discovery that subatomic particles travel haphazardly through space and can even exist in two places at the same time. It is a phenomenon that suggests that there may be an entirely new set of laws guiding the physical world, and even that multiple universes might exist simultaneously. This offers a completely different spatiotemporal framework for understanding the present and thinking about future making. More specifically, multi-worlds theory collapses the dominant narrative of linear spacetime that recounts history as a progression of events. Similar to the critique of historicism made earlier, this is necessary because in order to plot time so neatly, linear narratives are made up from a selective arrangement of events. Not only does this prevent such narratives having a diverse territorial and demographic reach, but it also limits the number of possible futures available since they have to be consistent with what has already been written. Remedying this, the idea of multi-worlds dismantles linear narratives by offering a framework for understanding the past and present as a constellation of events across time and space. Seen as a web of arrangements, a kaleidoscope of happenings, it presents an array of elements, places, times, people and collectives that interact and merge in infinite ways and take place simultaneously with no specific arrangement taking precedence. This framework, as Michelle M. Wright says in Physics of Blackness,  facilitates thinking of things that we take as ‘given’ as something that instead operates as a ‘when’ and a ‘where’, to open up a diversity of perspectives, performances and futures trajectories. Thinking about unconstricted space and limitless time at first appears to offer up more uncertainty than clarity. However, read another way, ontological pluralism does not further compound ambiguity but instead allows the limitless to be accessed as a multitude of specificities. In this way, El-Noshokaty’s pseudoscientific multi-world ‘colony’ situates the various arrangements and combinations for world-making beside one another in order to aid us in thinking more imaginatively about future making. It is a framework that extends out of the limitations of linear spacetime, so that the future can sit at once with all its potentialities rather than extending narrowly forwards. In El Manial Palace, in Darb 1718, in Rhoda Island, each with their three suns. The artworks and all their possibility float about my mind, level with each other, side by side. In the backseat of a taxi, in the lounge of a living room, and on the screen of my phone, cousins of yesterday’s news reverberate out. Through the dry crackle of the radio, hot coal throats croak about economic reform programs. Un-clicked links, news snippets; Trump and right wing resurgence unroll from my Facebook newsfeed. On the television, a familiar arrangement of pixels and fluorescing images capture terrorism and development projects. The same dusted-off words and images from the day before and the week before; recycled stories that are the symptoms of an unchanging present. But the present reality is richer than the format imposed on it. The artworks I have talked about here are the layers of futurability that lie in the texture of our global impasse. They are just some of the possibilities inscribed in the present, even if that present appears inert. Our contemporary condition has led to an inability to see the future, but as these works demonstrate, art and visual culture can serve as a useful tool to sketch out potentials and possibilities. Whilst Shady El-Noshokaty returns us to the basic of creation to open up a diversity of future trajectories, Sherif El-Azma haunts us with stale visions of the future to warn us against relying on the past, and Yasmine El-Meleegy develops our connection with all worldlings to embark on the project of future making from a more considerate perspective. Although these works are not prescriptive, and do not offer step-by-step instructions for making futures, they can be read as emancipatory visions to challenge the deadlock of the present. Katie Mcdougall is a research curator and cultural practitioner living in Cairo. She is an MA candidate in contemporary art theory at Goldsmiths, University of London, and is currently co-authoring a book on contemporary Egyptian art. Katie is the founder of Desert Undone, an alternative residency programme in Cairo for emerging artists that will be piloted later in 2019. Her curatorial interests include new models of collaboration, organisation and collective action in artistic and institutional practices, expanding the role of the gallery, the political potential of arts practice and aesthetic interventions, and fictions and future-making.